First of all, thanks to everyone who joined us for the January Meeting! We had a great time getting together. Welcome to all of the guests and new members that joined! Show & Tell: You all know that this is ALWAYS my favorite part of every meeting! I need to start updating my Ravelry Favorites immediately following the meetings, so I don’t forget about all the awesome patterns. 2012 is already looking like it’s going to be an exciting year! I can’t really spill all of the details yet, but we are planning an awesome trip for the summer along with smaller events, knit-a-longs, possbily a read-a-long and more! Also, in 2012 we decided that we just can’t wait for the next Hop, so we are planning to highlight one of the 12 LYS’s each month. We will start a carpooling list and let you know all of the details. There are so many unique shops! We will be announcing the January location by next week…yes, I’m behind on this. Sandee started the meeting by giving us a tough quiz. 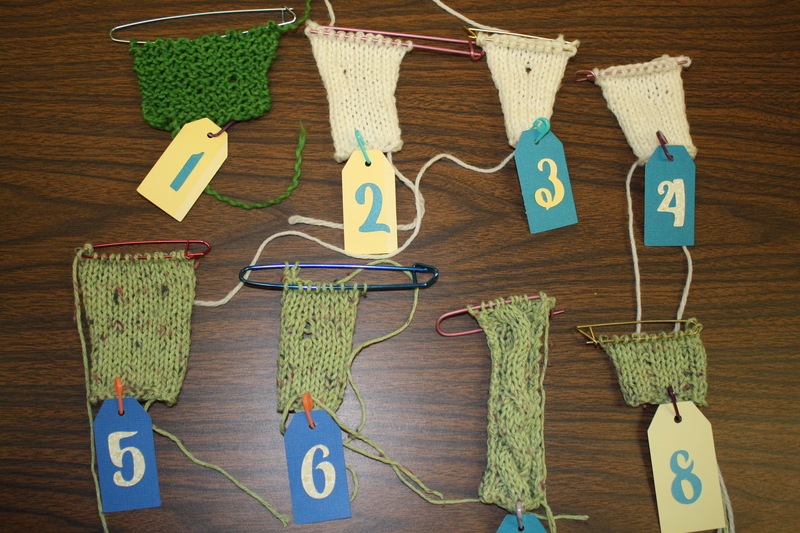 8 swatches were laid out and everyone had to go around and try to identify the mistake in each swatch. Ann was the only knitter who got 100% on the quiz! Way to go Ann…now we know who to call if we have a problem! LoL! Gail mentioned at the last meeting that she had just been to a scarf styling demonstration & we knew by all the gasps in the room that we HAD to have that on our agenda for January! Unfortunately, Gail’s Tuesday nights are full. Here is a video demonstration of 13 scarf styles…our favorite of the group was the Butter Braid!! I had to practice before the meeting (on my husband…thanks honey) and even he wears his scarf this way now. 🙂 Thanks for the idea Gail, we missed you! Other members demonstrated additional styles and ways to make your scarf unique-like stranding jewelry with it. Anyways, thanks to everyone for helping us kick off the New Year. Stay tuned…clearly there is A LOT more to come! See you next month, Tuesday February 14th from 6-8pm – Harvey County Courthouse (Newton). We will be exploring Mobius Knitting!!! Previous Previous post: January Guild Meeting!